From Becky (Pink) Champlain. 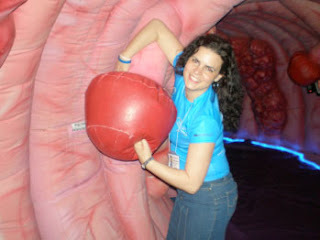 Colorectal cancer is often silent and sneaky, I can testify. At the age of just 30 years and with virtually no symptoms or family history of cancer, I was diagnosed with colorectal cancer stage IV. I owe a debt of gratitude to my family doctor who accidentally (or divine intervention), required laboratory examination on routine blood tests for colorectal cancer that seemed suspicious. She and many specialists, tried to reassure me by telling me that it was very rare to see such a disease grow at my age. By cons, my insistence to undergo further testing was justified where a colon tumor was detected during a colonoscopy. There ensued a series of tests and appointments with the doctor. Despite metastases (tumors rependu extends outside the colon) detected in my liver and lymph nodes, my doctors were convinced that I would have a good chance of overcoming the disease with surgery and chemotherapy . This is how it all began. In February 2010, I received a surgery to remove half of my colon and two-thirds of my liver. After six weeks of convalescence, I began a six-month period of chemotherapy. This was very hard on my body and a real challenge for my mind. From a positive point of view, time spent without work allowed me to spend more time with my youngest son (who was not yet two years old when I was diagnosed) and enjoy moments of joy and quality to our family cottage. Today, two years later, despite a relapse last year, when another tumor was found in my liver, I feel good and the prognosis is positive. It will not be for several years I know if I am cured of cancer and that's why I continue to live to the rhythm of a roller coaster of blood tests and screening in search of any sign of a return of cancer in my body. I note the support of my friends, my family and my colleagues who have helped me during difficult times. I am committed to raise funds and promote awareness of colorectal cancer by encouraging screening. I have enjoyed the support of education programs offered by the Canadian Association of colorectal cancer after becoming a member shortly after my diagnosis. I am proud to be involved for a second year with skiing challenge "Get up there! "Which brings generous donations to organizations and helps maintain awareness campaigns. Life is full of challenges, but none are insurmountable. I am eager to again reach the top of Mount Wentworth, my family and my friends by my side. If you want to share your story of courage and hope, to help us to encourage someone in their battle against this disease, please send your story to the following address reachstronger@gmail.com.